The top U.S. commander in Afghanistan apologized for remarks critical of the Obama administration in Rolling Stone magazine. In the profile, scheduled for publication Friday, author Michael Hastings writes that the general's aides mocked top civilian officials, including Vice President Joe Biden. 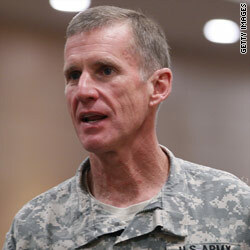 McChrystal, in a Pentagon statement, said early Tuesday he was sorry. "I extend my sincerest apology for this profile. It was a mistake reflecting poor judgment and should never have happened. Throughout my career, I have lived by the principles of personal honor and professional integrity. What is reflected in this article falls far short of that standard. I have enormous respect and admiration for President Obama and his national security team, and for the civilian leaders and troops fighting this war and I remain committed to ensuring its successful outcome." The White House budget director has told President Obama that he plans to leave his position in July, an Obama administration official said Monday evening. Orszag, 41, has been a key part of Obama's economic team, serving in his role as director of the Office of Management and Budget during the passage of the economic stimulus bill and this year's health care reform legislation. As budget director, he crafted policy, but also was a prime negotiator with congressional Republicans. Orszag is known in the halls of Congress for wearing cowboy boots with his business suit and has quoted country music songs during budget hearings. Mental health workers are concerned that fishermen and business owners in areas impacted by the BP oil disaster are facing a widening epidemic of despair. The Los Angeles Times reports that the Exxon Valdez oil spill resulted in a wave of suicides, domestic violence, bankruptcies and alcoholism in Alaska. Picou, a sociology professor at the University of South Alabama, conducted groundbreaking research on oil spill stress in Cordova, Alaska - a town hit hard by the 1989 spill. According to the newspaper, Picou is now living some 400 yards from the oily sands of Orange Beach, Alabama. He's been speaking to community forums and fishermen's organizations, warning of the dangers of isolation and anger. "The first suicide occurred in Cordova four years after the spill. I try to explain to people, this is a marathon, and you have to try to stick together. And you have to try to take care of yourself," Picou said. "Don't become obsessed with sitting in front of the television watching this wellhead just gush thousands and thousands of gallons of oil into the Gulf of Mexico every minute." Picou is currently directing a five-year study of community recovery from Hurricane Katrina in Mississippi and Louisiana. The openly gay Fulton, Mississippi, teenager, who missed her official high school prom, now has a lot of other very special invitations. USA Today reports the Itawamba County School District refused to allow McMillen to bring her girlfriend to her prom, saying it would cancel the event. She went to court and a federal judge ruled the district had violated her civil rights. The school then held two proms, according to McMillen, and she was duped into attending a much smaller "decoy" prom in April. The newspaper reports that McMillen is scheduled to attend Tuesday's White House reception in recognition of LGBT Pride Month, where she and other lesbian, gay, bisexual and transgender citizens from around the country will meet Obama. On Friday, McMillen with be the guest of honor at a benefit concert in Woodstock, New York, featuring Ronnie Spector of the 1960s girl group The Ronettes. This Sunday, McMillen will serve as one of the grand marshals in New York City's gay pride parade. The 56-year-old native of Lilburn, Georgia, claims that her family and neighbors along Gwinnett County's Hood Road - named for her father and grandfather, who built it - are being threatened by their Islamic neighbors. The Atlanta Journal-Constitution reports that Hood led 400 Lilburn residents in November in an effort to persuade the Lilburn City Council to block the expansion of the Dar-E-Abbas Mosque on Hood Road from 1.4 to 8 acres. Following the council meeting, Hood was followed and boxed in by a van and sport utility vehicle full of "Middle Eastern' males," according to a police report. Harassment has increased since then, she says. "It's getting worse and worse," Hood told the AJC this past weekend. "All we get from the police department is, 'Stay in your house.' We will stay in our house, but we shouldn't have to." Wasi Zaidi, a founding member of the Muslim congregation of Dar-E-Abbas, said residents' claims are "all lies and B.S." Some residents told the newspaper they are now carrying guns. "We have been unable to substantiate any crime by any person there," Lilburn police Capt. Bruce Hedley told the newspaper. "Suspicious cars simply driving down the road is not something we can arrest someone for." I just love all these moronic comments by Bush Supporters. Bush was the biggest idiot on the planet. 7 years that bozo and his white trash persona but Obama buttons his coat using the wrong hand and people get in a tizzy. I say let the Meteor hit and wipe the slate clean. See if we can get it right next time. As YOU say, he WAS the biggest idiot on the planet. So are you agreeing that Obama has taken his place and is NOW the biggest idiot on the planet? You guys can dish it out, but you don want to take it. To paraphrase Jay Leno: What the hell were you thinking? Maybe McCrystal, like the Captain Holly Graf who was relieved of her ship command recently, just came through the ranks too quickly and this post was too much too soon. Regardless of what McCrystal has accomplished, it is very unlikely you will find any active or retired flag level officer of any branch of the military, whether they hate or love Obama, who will support this blatant insubordination. Add the facts that this is not his first offense, that each offense grows in proportion to his position, and that we are now seeing reports from some of the forward units who appear to be far less than enthusiastic about McCrystal's leadership; it brings into serious question the quality of the man's judgement and his ability to be effective. Are military personnel not given the right to Freedom of Speech?